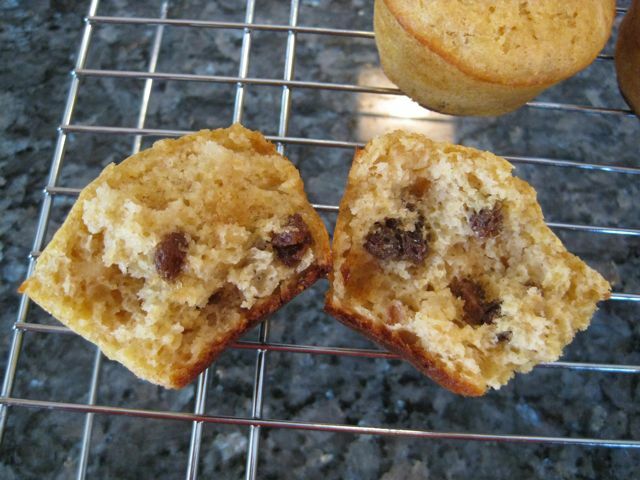 This week’s recipe for the Tuesdays with Dorie bakers is Great Grains Muffins, selected by Christine of Happy Tummy. Leave it to Christine to find a somewhat healthy recipe for us to bake! But really, when I hear Happy Tummy, I think chili. Her vegetarian chili has been in regular rotation at our house since she posted it. Sometimes I make her vegetarian version and sometimes I add ground turkey. It’s great either way! I made 1/2 recipe, which yielded 6 muffins. I used raisins and almonds for the dried fruit and nut mixture. To reduce the fat, I replaced half of the melted butter with plain yogurt. How it went: Quick and easy: mix the dry ingredients, mix the wet ingredients, bring them together quickly, stir in the fruit and nuts. A lot of bakers reported that theirs baked much more quickly than the recommended 18-20 minutes, but I baked mine for 19 minutes. How it tasted: These are a nicely not-to-sweet muffin. I had one warm from the oven with some strawberry jam. I think that honey would be good on these, and just noticed Dorie’s recommendation to serve them with cream cheese, which sounds wonderful. Next time, I would leave out the cornmeal (just my personal preference) and replace it with more oatmeal and wheat flour. My husband is more of a streusel muffin kind of guy, so I have these all to myself to enjoy for breakfast this week. If you want to give these a whirl, look on page 8 of Baking: From My Home to Yours, or the recipe will be published today on Happy Tummy. I wish I’d thought of the yoghurt trick to reduce the fat. Nonetheless I loved these, and yours look great. Your hubby is missing out! Raisins and almonds sound like a great combo in these…we loved them and I will be making them often as they literally flew out of the basket with requests for more! Yours look wonderful, full of goodness! I think these look delicious and pretty healthy for a muffin. Your muffins look perfect, just like the photo in the book. I changed them us quite a bit and didn’t think I liked them, but they have grown on me and are actually really good. Awww, Jill. So glad you’re still enjoying the veggie chili. I made a big pot of it myself this week. Perfect for the snowpocalypse we’re experiencing now. When I think of YOU, I actually think of the old header you had way back in the day, of the desert sand dune. I can’t remember where you said it was from (somewhere from your travels, I think), but it looked so exotic…and I wished I could see it in person! Glad you enjoyed the muffins this week–they look fantastic. Subbing half the butter with yogurt was brilliant! Thanks for baking with me! I like that photo too – maybe I should switch back. It’s from Namibia! I upped the buttermilk a bit too, since I knew I’d be slathering these with butter! The cornmeal was a bit gritty at first, but I found it softened up a bit after they cooled. 2) Finally watch Mad Men. I just finished season 1 and love it. By ‘it’ I mean Don Draper. The muffins look great! I didn’t get around to making them (silly, I know – obviously it’s a quick recipe), but plan to ASAP. It’s nice to know they don’t suffer by reducing the butter a bit. You’re not the first one who said something about the cornmeal. I’ll make a note in my cookbook. Just on looks, I’m thinking apple butter would be good–at least with your raisin version. Your muffins look fabulous…I’m sorry that I didn’t make these!